For this week’s vase, I’ve chosen a cool, all-white palette. White garden phlox (P. paniculata) are in their glory right now, as are the Annabelle hydrangea (H. arborescens ‘Annabelle’), whose bracts are turning a papery, lime-green. Plume poppy panicles (Macleaya cordata) are setting seed, making a nice vertical accent, but I love them for the fuzzy, white underside of their leaves that show best on windy days. Garlic chive umbels (Allium tuberosum), with their clusters of green-centered, star-like blossoms, make long-lasting cut flowers. Larger stars of white flowering tobacco (Nicotiana alata), lacy spider flower (Cleome hassleriana), and tiny blooms of daisy fleabane (Erigeron annuus) complete the arrangement. The clear, rectangular vase was a wedding gift (over thirty years ago!) and the beautiful linen tablecloth with intricate drawn-thread work is from my vintage textile collection. The design of spiderwebs and sunflowers is truly a work of art that must have taken many hours of painstaking needlework. 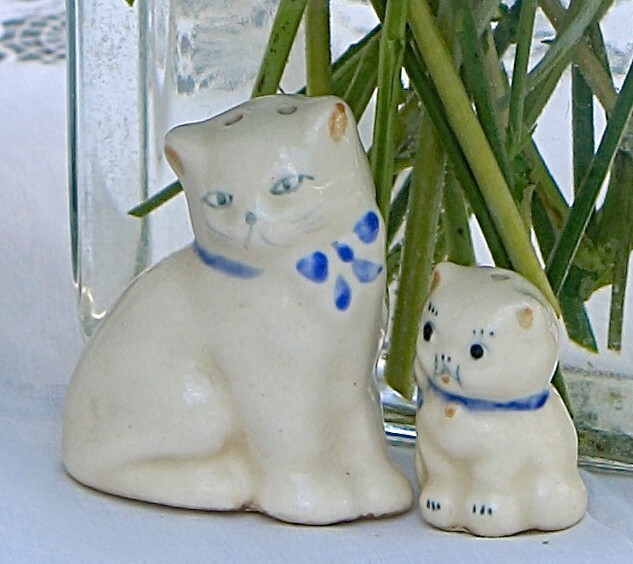 The cute vintage Mama cat and kitten salt and pepper shakers I’ve had for many years and were probably from a yard sale. This entry was posted in Country Gardening, My Photos and tagged cleome, drawn threadwork, flower arrangement, flowering tobacco, flowers, garden phlox, gardening, gardens, garlic chives, In a Vase on Monday, meme, photography, plume poppy, vintage textiles, Weekly Vase Challenge. Bookmark the permalink. Really nice arrangement for a hot day! I love white gardens and have one so this vase really caught my eye. Such a perfect presentation and a stunning mix of flowers! Thank you Donna! I was just over to your site admiring your arrangement – the lilies must be perfuming your home delightfully! I cannot keep up with those darn red lily beetles and have lost many orientals to their voracious appetites. Wretched pests! I truly love this. It’s just beautiful. Oh so refreshing this hot day! And wow, what a beautiful arrangement and I LOVE that you included that textile which is absolutely stunning. I just saw a beautiful work of paper cut out art that blew me away and reminds me of the textile! I just planted a plume poppy – I hope I am not sorry as I heard they can be invasive but really, that’s what my garden is – a collection of brutes so we’ll see. I love the leaves! It was given to me – how does a gardener say no? 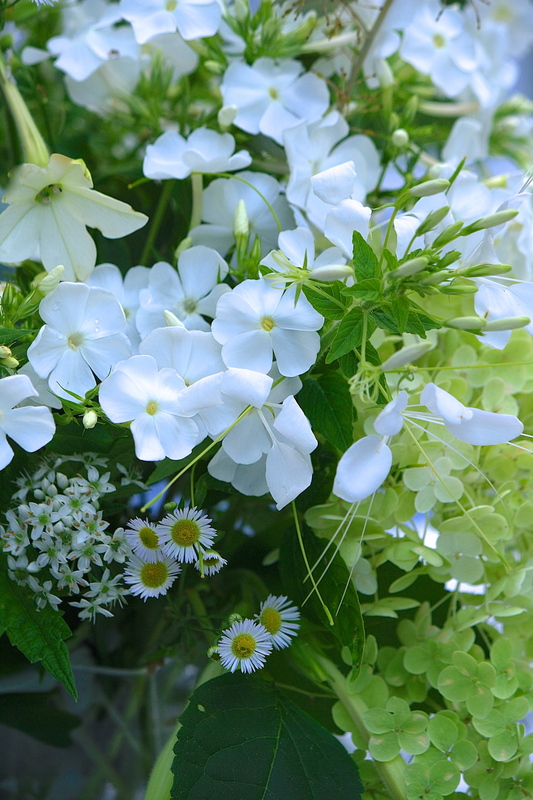 I have white phlox handed down to me from my mother from her mother (my grandmother) – it looks so fresh and smells so delicious! Love this artful bouquet Eliza! Thank you, Amy. Our Grandmothers did that kind of thing, didn’t they? Our generation, not so much. 😉 I don’t think I could sit still long enough! Such care you take in setting the scene for the beautiful bouquets each week. It is such a lovely thing you do, Eliza. Thank you. So charming Eliza! You are an inspiration. When I went out to cut the last of our pale pink english roses, I looked around for what else I could add to the cobalt blue vase. I choose charteuse hosta leaves and pale lavender phlox. Small white daisies would have been perfect. Thank you, Val. Glad you felt inspired. 🙂 Let your creativity flow! Your vase sounds lovely! Reminds me of summer weddings – lovely! Thank you. 🙂 I thought that, too, after I posted it, it crossed my mind. GMTA! Nice arrangement Eliza, so delicate. I feel cooler just looking at your vase – it’s lovely! The cats and tablecloth are nice touches too. Thank you, Kris. With the heat everyone’s been having (esp. you), we need a little cool! Just like your exquisitely ‘cool blue’ vase this week. It’s gorgeous! There is no way to choose a favorite in your collection, but this comes very very close. The whole effect is perfection. 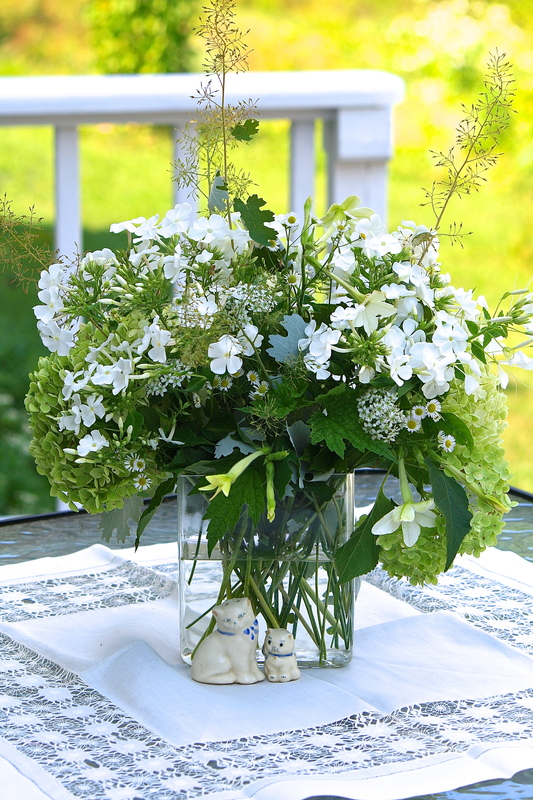 I love white flowers, you have arranged them beautifully. I admire the white drawn thread work embroidery, I used to do a lot of embroidery and I especially liked the lace-like effects that could be created by pulling out threads. 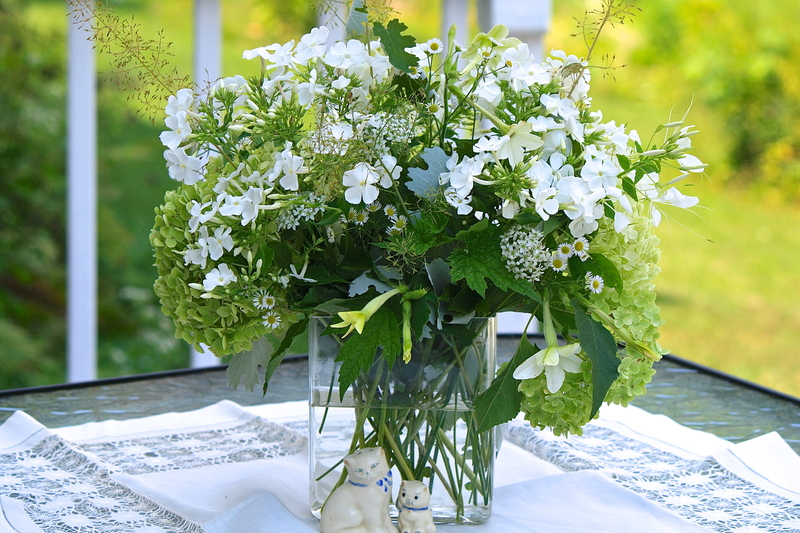 The white flowers give this simplicity of color, but the many tiny and varied flowers mixed with the green hydrangeas and many shades of green, plus the tiny sprays of Plume Poppy, make a very complex and compelling arrangement. 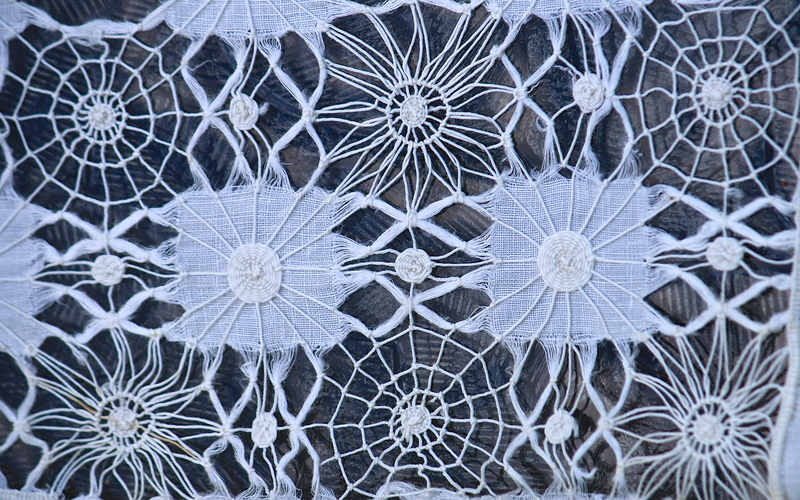 The spiderweb and sunflower designs in the linen tablecloth are really skillfully done. Thank you so much, Hannah. I loved your little vintage vase you used this week. So pretty! I love your Monday series! If I didn’t have cats who would make quick work of such a display, I might make one for myself. I’m glad to be able to enjoy yours! Mine – specifically the female – eat everything green I’ve ever brought in the house. The girl ate so much of a 4-ft palm that the poor plant died. Add the death of plants to the cleanup of green vomit, and I just don’t try with plants indoors anymore. Linked to you again through the new Fod Ambler blog. Just trying to find where all this virtual stuff disappears to sometimes. You do provide some inspirational arrangements. I struggle with my newish camera. What is yours? Thank you! My camera is a Canon Rebel XS and the lens I use most often is 55-250 mm. The total arrangement is exquisite…would be a lovely wedding bouquet. Thank you! Always a pleasure to hear from you. Happy 4th to ‘Zilla! Did you get my email? My comments aren’t posting to your site. Are they in your spam folder? I want to climb inside your flower arrangements to live….wish I were a little fairy! Eliza! You seem to have an endless supply of flowers! Thanks for sharing them with us. This is a truly lovely arrangement. Of course, she would want the pretty delicacy of babies breath to keep little Samuel’s memory near. How is she doing? She is young and hopefully resilient, having the strength of youth to soldier on. Sending my blessings.